We are living in a world of android phone. Today, android phone has become the vital part of our life. These advance phones help us to recover and backup our data such as contacts and messages in them. Many people don’t know to recover your data from these phones. But to recover your data you need to make a backup. So, today we will learn that how to backup contacts and can save all our important data. To backup your contacts you have to follow some easy steps. First open contacts menu from your phone. Select more option by pressing the settings button. In the next step you will have a window to import or export contacts. Select any of the options and your contacts will move. If you choose Gmail for saving contacts, then follow the other proceeding steps. Now, open your Gmail account for sync your accounts. Log into that account from your computer. Now, from your phone, go to setting > Accounts & sync > on the right to Add accounts, add your Gmail account there will all your information. When you are done. Save it. Continue repeating till your contacts saved. When your contacts saved, go to main menu of the phone, go to “settings” > backup & resets > Backup & restore > Backup my data > and Click/Check it. So, finally you have synced your accounts with your Android phone. 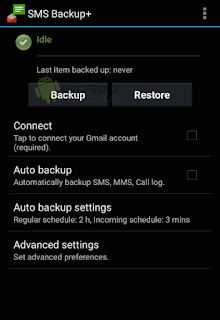 How to Backup Messages in Android Phones? You can save your messages backup in your android phone. You have to just follow the following easy steps. First backup your messages you need to download SMS Backup+ application from the play store. Once it downloaded, open it and tap to “Connect”. There you will show options of backup and restore, and connect. Check out the connect option where your Gmail has shown. Now allow the application SMS Backup+ permission to access your Gmail account. Now, after this you have to go back to the application, the option of “Backup”. Click it. This will allow saving all text messages to your Gmail account. Now after that you have to Log in to Gmail account from the computer and on the left side you will see the option as label-SMS. When click it you will be able to view all the text messages that have backed up. To restore these messages, just click on the Restore option in SMS Backup+. Click OK button in the option given. Make that application set as default app to restore messages. This is an important step. Now your all messages are saved and restored to your inbox.